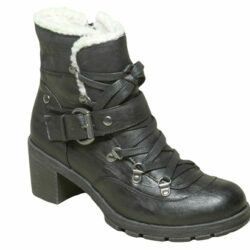 Gumboots can be worn on rainy days, in the dirt, mud or just for an outfit accessory. Gumboots are worn both for their functionality-protecting the foot and leg from water. Gumboots are waterproof and are made from rubber. 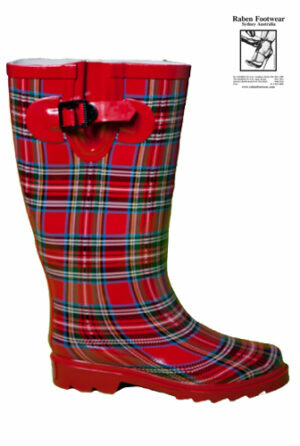 Ladies gumboots Red Tartan for Style and Fashion. 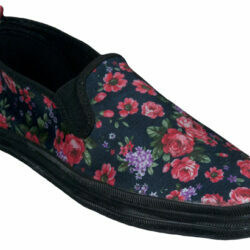 Women's low cut slip on with buckle, available in Whole Black Canvas, Black & Red Floral Satin and Pink Floral. 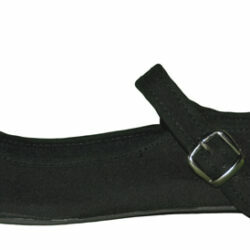 Non leather upper, non leather sole.